The original church is in the form of a Latin cross, with lines of Corinthian columns separating the nave from two aisles. ✴In 1322, it was decided to rebuild the original apse. The present polygonal apse was built in Gothic style on part of the church cemetery. Work was still not complete by 1371, at the time of the publication of the new Libro degli Statuti. ✴In the 14th century, a fourth aisle was added between the original right wall of the church and the city wall. As noted above the apse was completed in ca. 1371. Traces of frescoes survive in the second of the seven chapels set into its walls, although most of them are obscured by the choir stalls (see the page on the Frescoes in San Giovenale). ✴the arms of Bishop Carlo Boccardi appear under the Virgin Annunciate at the other end. 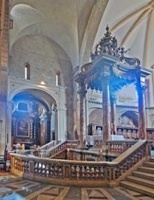 The stalls might have been installed in their present positions, although it is also possible that they were moved here from a location in front of the high altar. ✴the twin staircase with marble balustrade, leading down to a new crypt. This panel in the central bay of the apse, directly behind the high altar, is attributed to Girolamo Troppa. ..... and, from the other side, in the crypt below. ✴the Cappella Nuova della SS Sacramento, to the right of the presbytery. The page also describes the Cappella della Consolazione, off the 5th bay of the left aisle. The construction of the new right aisle required the demolition of much of the Sacello di San Cassio: what remains is now behind the marble screen on the right of the fourth bay of the right aisle. In addition to the works below, see the section above on the presbytery and page on the Frescoes in San Giovenale. ✴In 1700, two panels depicting, respectively, SS Juvenal and Cassius, and their gilded surrounds were moved from the chapel below the sacristy, which belonged to the Compagnia di Sant' Antonio, to the main part of the Duomo. The panel of St Juvenal was documented again during the episcopal visit of 1708, at which point it was in its current location, on the pilaster at the end of the colonnade on the right, opposite what was then the Cappella di Santa Caterina (now the Cappella della Beata Lucia). However, no mention was made in 1708 of the second panel, and its current location is unknown. The panel depicts the saint, identified by inscription, standing in a fictive niche, holding a palm in one hand and blessing the viewer with the other. The palm suggests martyrdom, although there is little in the hagiographic tradition that suggests that he was martyred. His cassock is rendered in exquisite detail. Scholars also attribute the panel of St Juvenal to il Vecchietta, and suggest that Cardinal Berardo Eroli arranged for him to work in Narni in the period around 1475. It is possible that the statue of St Antony Abbot was originally flanked by the panels of SS Juvenal and Cassius in a single triptych. ✴St James, flanked by SS Peter and Paul (on the right). This painted wooden Crucifix, which is in a niche in the left aisle, might have come originally from Sant’ Agostino: a panel (15th century) of four standing saints, which probably originally formed its backdrop, survives on the right wall of this church. The arms of the figure of Christ are moveable, which suggests that it was removed from the cross and taken in procession during the Easter commemorations. This fresco, which is by a follower of Pier Matteo d' Amelia, is at the end of the left aisle near the apse (behind the statue of St Antony Abbot). The figure of the Madonna and Child is attributed to Bartolomeo Torresani, but the other figures seem to be by a different artist. 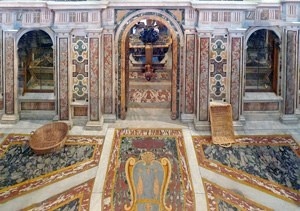 This altarpiece, which depicts Christ consigning the keys to St Peter is on the Altare di San Pietro (2nd on the left). It is signed by Livio Agresti and dated by inscription. ✴putti holding shields bearing the Cesi arms, to the sides of the epitaph. 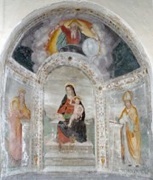 The damaged fresco in the lunette, which depicts the Madonna and Child with angels, is the autograph work of the so-called Maestro della Tomba Cesi. This damaged tomb is on the left wall of the 2nd chapel on the right. (Bishop Boccardi commissioned the portico on the facade of the church, and his arms can still be seen above it). This monument in the left aisle, just before the entrance to the Cappella della Consolazione, commemorates Bishop Erolo Eroli, who died in 1600. It was commissioned by his niece, Paola Eroli, and her husband, Giovanni Battista Cardoli. The monument contains an interesting portrait of the deceased as a relatively young man. 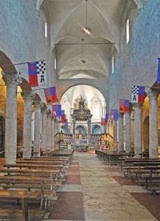 It probably dates to about the time of his appointment as Bishop of Narni, in 1578.
proceed to: Sacello di San Cassio; Chapels of San Giovenale; Frescoes of San Giovenale. Return to Monuments of Narni.